ASHBY & EYEVORY – „… live together in perfect harmony“ – these wise words from Paul McCartney couldn’t be more fitting than in this situation. 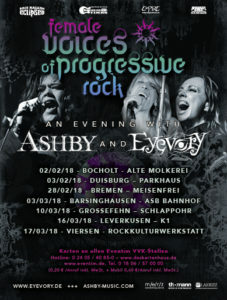 We joined forces with another female-fronted progressive rock band, the wonderful “Ashby” from Mülheim an der Ruhr. We – sort of – knew each other but when we performed on the same day on the “Night of the prog”- Festival in July we enjoyed each others company and decided to play some shows together! 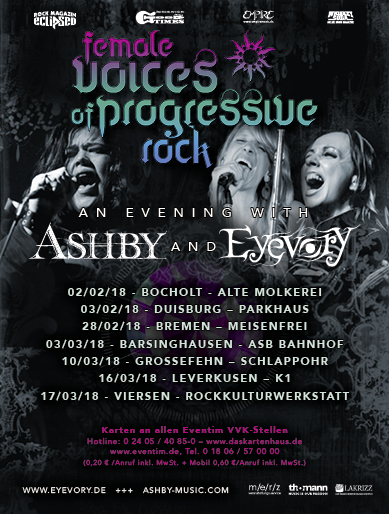 So now we’re celebrating this new friendship of two bands that play two very different versions of female fronted progressive rock! We’re inviting you to join us in early 2018 on our exciting journey! It’s gonna be full of passion, emotion and music!